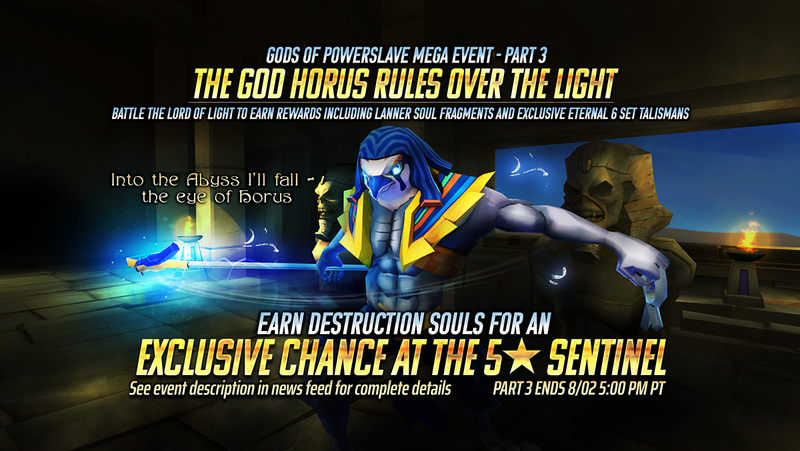 28 Jul Rule Over the Light Event – Exclusive Chance at Horus – Starts Today! Worship the God Horus! This towering 5⭐ Sentinel is an all-enemy true damage attacker who deals additional damage based on MAX HP and Missing HP, while removing and inflicting effects. God Horus is the third God to be released as part of the Gods of Powerslave Mega-Event. This is a series of events that will be running until the end of the summer where you can work towards earning the five different Gods of Powerslave! Even if you don’t get Horus in this event, you’ll be able to work towards a guaranteed soul for him (or another God of Powerslave) over the course of the Mega-Event (For full mega-event details, head to the in-game newsfeed!). Horus’s event, Rule Over the Light, runs from July 28th to August 2nd at 5pm PT. Win Lanner Souls, and exclusive 6-set Eternal Talismans by completing event challenges in the Lord of Light Dungeons! Lanner Souls are limited time event souls which guarantee a 3⭐ to 5⭐ character of any class, with an exclusive chance of getting God Horus! BONUS: Complete all event challenges to earn our newest Talisman set: Eternal Talismans. Eternal Talismans are a 6-set that provide two devastating effects: They grant each ally invulnerability against physical, magical, or true damage every turn, and grant Immortality or Endure to self and a random ally every turn!